Canned Heat I was published several months ago. To catch you up to date includes 2 flocks of chickens decimated by an 11 year old dog and a summer garden. We finally got the chicken/dog issue straightened out. But the fact that chicks were sharing my work space and I wasn’t going to run power-tools and use chemical sealants around them, meant the Mister saw no need to make a jig if I wasn’t going to use it immediately. The upshot is, I am just now getting around to the 2nd phase of the project. So after cleaning the cans I set up a jig on the drill press to take out the bottom of each can. 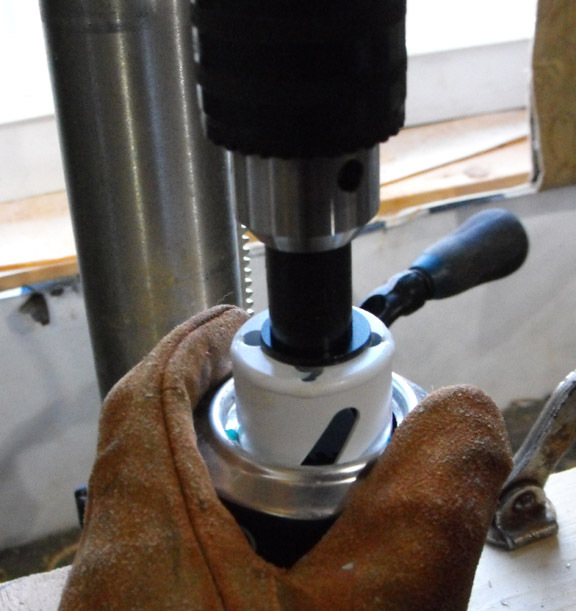 Initially this consisted of a board bolted to the table on the drill press with a groove routed out. This was held onto the table with 2 vice grip clamps. The Gorilla Tape helped to fill the space to create a snug fit, but was slick enough to allow the can to be inserted and removed smoothly. 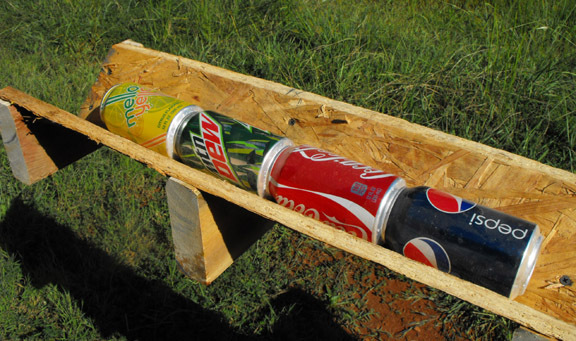 The bevel in the back allows the can to fit, as the hole saw was long enough to interfere with placing the can into the jig. Note the sheet-rock screw. 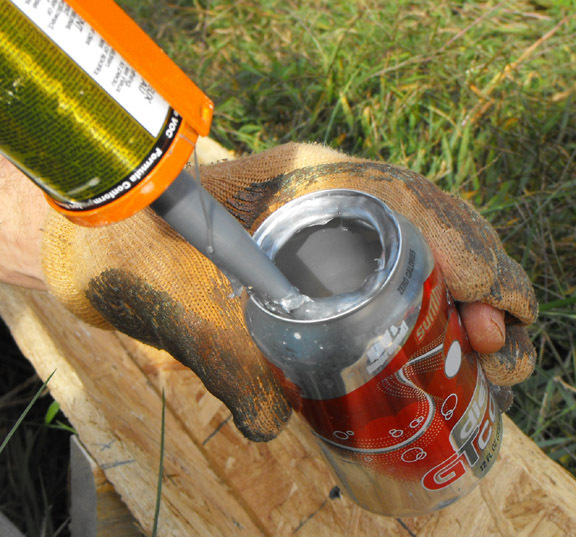 I found that if you put the screw inside the can opening and twist it until the side of the opening touches the screw, you simply have to hold the can down. This means you don’t have to squeeze the can to prevent it from spinning and you avoid crushing the can. 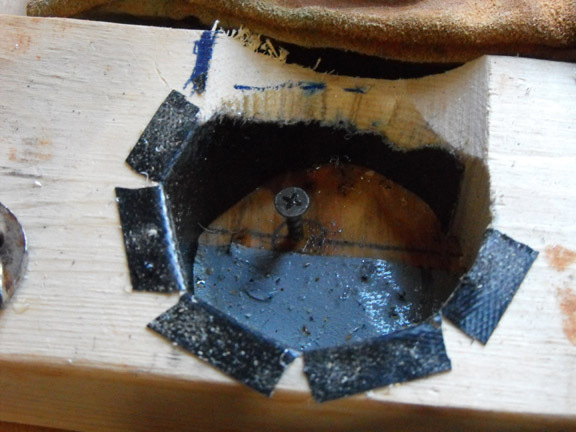 I used a 1.5″ bi-metal hole saw. Please wear gloves and safety glasses. Drilling creates a lot of metal shavings. They are sharp and small and would not be pleasant under the skin. Next, I needed to cut the tops to allow more air flow. 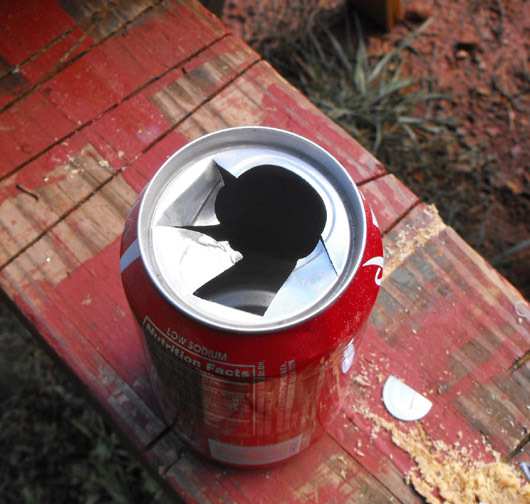 You don’t want holes that are as big as the can, nor do you want them to align perfectly. Large, perfectly aligned openings, allow the air to move through too quickly for the air to make much contact with the warmed metal . 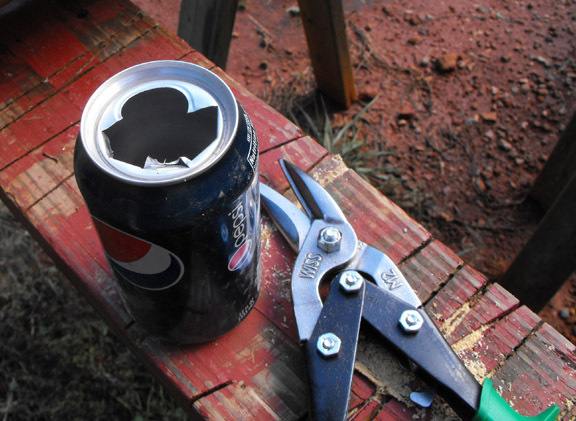 So using a tin snips and cutting the top into a series of tabs will allow you to bend some of the tabs. The bent tabs create baffles, which creates turbulence in the air flow. This turbulence causes the air to touch the warmed metal more often, resulting in warmer air. Next you will want to push some of the tabs down. Please don’t use fingers. 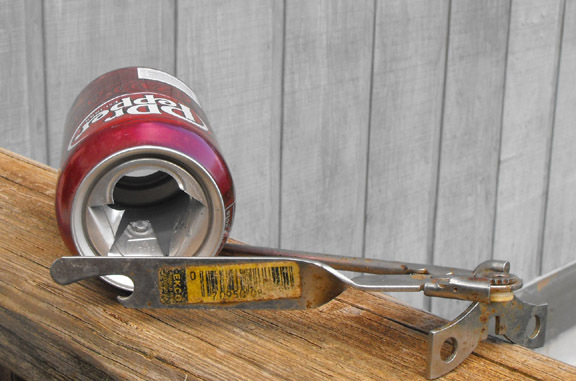 I use an old stand by that you probably already have on hand: an inexpensive can opener. So, all that done, I needed a jig to hold the cans in place while the adhesive cured. 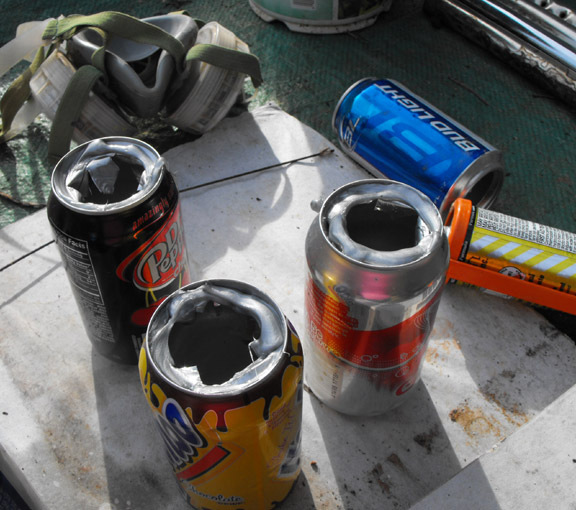 I’ve seen people use angle iron and other types of contraptions, but the main idea is the keep the cans stable and in line while the sealant sets up. And, although I love the Mister, he has a tendency to …*ahem* over build things. 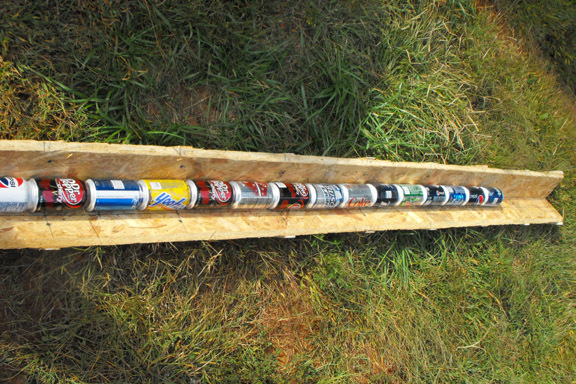 (At least in my humble opinion) And the jig for the cans was no exception. All I needed was two 2×4’s joined to form a right angle. But nooooo….. I got a fancy jig instead. One that took a lot longer to build, but I’m not sure works any better. But, at least he got the job done. Sometimes that’s all you can ask. So we’ve jumped ahead a bit with this picture, but I just wanted to show you the basic idea. I’m using a sealant for roof flashing. It is U.V. and heat resistant. It takes 24 hours to cure before painting, hence the need for a jig to held it in place. 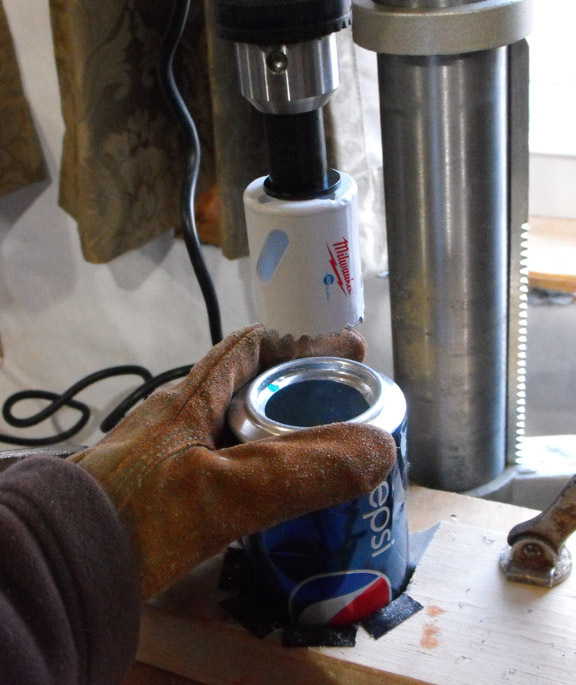 I’ve found it best to apply sealant to several cans at once, then place them in the jig, making sure that the cans are seated one atop the other and in contact with the sides of the jig. Use enough to adhere the tops and bottoms together, but not so much that you have to do a lot of clean up after the sealant dries. I can do about 1 1/3 stacks a day. So, in less than two weeks I should be able to the 16 stacks needed for the heating unit. I’ll try to be a little more timely with the next part of the project. Stay tuned.